Jim Gorant, a senior editor at Sports Illustrated, does a remarkable job of presenting these facts in his book The Lost Dogs. 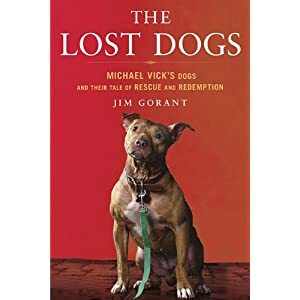 The book leaves you feeling sickened that a man like Vick could be playing football again after a mere 19 months in prison, but also feeling revitalized to learn that so many of the pit bulls have survived what they were forced to endure. Gorant pays credit where it is due: to the investigators who managed to obtain a near impossible warrant and eventually indicted Vick; to the shelters that helped care for the pit bulls after they were rescued; to the many people who assisted in rehabilitating the pit bulls; and to the pit bulls themselves. Gorant reveals the true side of not only the Vick dogs, but also an entire breed. Plainly stated, pit bulls are discriminated against, especially in the media. This book takes a step in the right direction, clearing the name of a misunderstood and mislabeled breed. Gorant takes the reader through a step-by-step analysis of the process of indicting Vick and rehabilitating the pit bulls. He begins at the investigatory stages, explaining all the difficulties the investigators (Jim Knorr of the USDA and Bill Brinkman, a Surry County Deputy) had to endure just to get permission to assess the complaints against Vick. They suffered further criticism from the public and from the media. Many people, including the Virginia District Attorney Gerald Poindexter, suggested that the case against Vick was strictly about punishing a celebrity in order to make an example out of him. However, for Knorr and Brinkman, it was about the dogs. The remainder of the book covers what occurred after the investigation. Gorant explains exactly what happened to each pit bull in the group of 49 that were rescued. The Humane Society labeled these dogs as “some of the most aggressively trained pit bulls in the country” and recommended that they all be euthanized. PETA described these dogs as a “ticking time bomb” for which euthanasia was “the most humane thing.” But when given a chance to actually interact with humans, Gorant shows that these dogs surpassed the low expectations. He explains that the dogs were actually victims that desired to forgive and regain trust for the species that maliciously abused them. As Gorant points out, 20 of the 49 dogs were put up for adoption, 25 were placed at various animal sanctuaries (some of which would go onto to become adoptable), and only 2 were euthanized (one due to health concerns, not due to aggressiveness). These dogs could not have gotten to the point where they are today without the help of countless individuals, to all of whom Gorant gives recognition. In a world where the media never ceases to find a pit bull attack to report (whether true or falsely portrayed), where cities and towns are banning the entire breed of pit bull (commonly called “Breed Specific Legislation”), and where people cringe at the suggestion of someone adopting a pit bull, Gorant’s book shows the true character of a lovable creature. (Gorant, 93). If these actions were taken towards another human, Vick would not have one fan sporting his jersey. He would not have a multi-million dollar contract. He would certainly not be living outside the confines of a penitentiary. But it didn’t happen to another human, it happened to a dog. I conclude with the words of Gorant himself: “The truth in the end, is that each dog, like each person, is an individual. If the Vick dogs proved nothing else to the world, this would be an advance.” (Gorant, 126). I think the Vick dogs have done much more than this. These dogs have shown that discrimination can exist towards people, as well as, animals. But like people, animals forgive. Gorant’s The Lost Dogs does an excellent job presenting each dog’s story of forgiveness and rehabilitation. This book is a must read! Thanks for posting this. The enormity of what these dogs have proven cannot be underestimated and their ability to forgive is just one part of that; they have yet again demonstrated what can be achieved when sentient beings of whatever species are treated with love, compassion and understanding. I agree, a must-read book. Wonderful review. It’s truly remarkable what those dogs have been through and their capacity to forgive is amazing. Thank you so much for being on the tour. cool review. I just bought the book thanks to you. ditto. thanks for putting on my radar. this is a complicated story, both of the breed, mike vick, the owners, the public, dog ownership and its culture, and all of us generally. i have strong, seemingly contradictory feelings on this topic, but i’ll reserve expression until i read the book. contradictory feelings about dog fighting? Weird.